Going to the salon can be difficult at times. 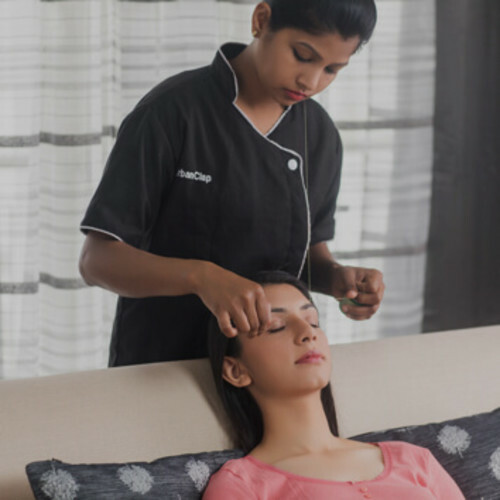 Book salon at home in Pune and get 4.5 + rated senior beauticians with 5 years of experience. We provide services like Rica waxing, fruit cleanup, bubble spa manicure, detan facial, etc at the comfort of your home. Our beauty parlour experts use branded, disposable and hygiene friendly products. Book our salon services to enjoy hygienic and mess-free beauty parlour services at home in Pune. Wonderful service as usual. Thank you. I called her a little late than the scheduled time. Maya is excellent. Good at her work. Also very friendly. She was organized and clean. Talk less and concentrate on work. Only thing was that she was late for 22 minutes and she not once called before coming so I had to call and confirm. Threading was bit painful. She is very professional and does her job effortlessly. Wondeful service. Perfectly hygenic, thorough and relaxing. Sonali was quite friendly and very professional with her job. Impressed with the services. Very professional service .happy with the service. Samreen is very efficient and very pleasant. She is really good in waxing.. Did waxing very smoothly and calmly. Very happy with service. But for mani and pedi only one sachet provided by company which is a little unfair..
To get a facial or hair spa treatment done at home nowadays is very convenient. Earlier, you either had to go to salons for any hair spa or facial treatments or plan in advance and wait for the right time. Now, it is easy to book skilled cosmetologists who can come to your house and provide necessary hair and skin care necessities with their professional salon services at homes. Save Time: As the beautician who offers salon services at home will arrive at your doorstep at a prearranged time, you don’t have to be worried about wasting your day in its entirety. If you were heading to a salon, it would take most of your day to reach there and you would then have to wait for your turn. Feel Comfortable: When you go to a salon for a hair spa or facial treatment, you have to leave straightaway when the treatment gets over. You may also find that the ambience inside the salon very unappealing. Due to these reasons, you may not find the whole process of beauty treatments to be comfortable. That changes when you book salon services at home. 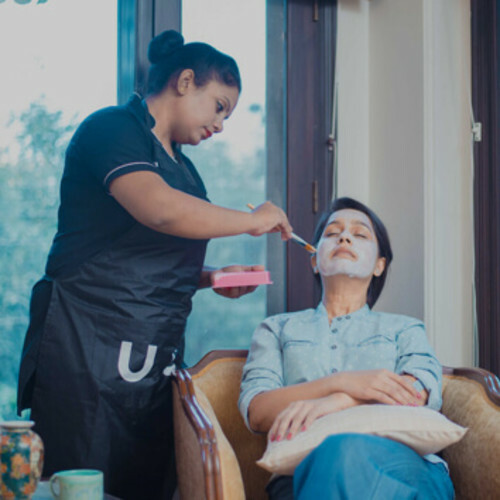 Read a book or magazine or listen to your preferred tunes during the treatment, or even take a siesta when the beauty treatment at your home is over. Relaxed Services: In a salon, many customers wait for their turns for beauty treatments and cosmetologists have to consider that. In this way, sometimes beauticians can make haste to finish the beauty treatment to accommodate the others. Cosmetologists offering salon at home services come prepared for a particular duration where they are not pre-occupied with other customers. Group Treatments: By hiring beauticians at home, you can also ask your best friends to join you for a pamper session. You can all get ready for a party in a fun manner and talk as much as you want. This won’t be the situation in a salon. Most likely, you and your friends will need to wait for your turns and then would be placed in different rooms. In this way, you and your friends won’t be able to enjoy the pamper session as much. 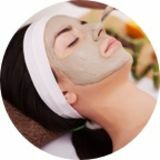 Glow Facial: The skin tends to glow with the products that are applied in a glow facial treatment. Anti-ageing Facial Treatment: This type of facial is for people with wrinkles and fine lines. Anti-ageing facials can effectively soften the fine lines as well as provide good nourishment. Brightening Facial Treatment: Brightening facials can lighten up one’s dull looking skin. One’s skin can look dry if it is dehydrated. De-tan Facial Treatment: Apart from doing away with tanning, a de-tanning facial treatment can bring back one’s normal skin colour. Cleaning of the pores: Skin can be damaged mainly due to dirt and pollution as they stay in the skin’s pores. One’s clear skin can only show with exfoliation as the pores of the skin get completely cleaned. Facial Massage: Whether it is a facial clean up or a facial treatment, the most essential part is a facial massage. Apart from removing toxins of the body and improving the skin’s appearance, massage helps in blood circulation and also aids in relaxing the muscles of the face. Specific Masks based on Skin Type: There different facial masks based on the different types of the skin. A water-based or gel-based facial mask is put on those who have oily skin, which removes the oil left in the skin’s pores. On the other hand, people who have a dry skin would need a moisturising mask. Facial treatments should be done on a frequent basis but many people are not certain about how regularly they should be done. Skin specialists say that older people go for facials once every two weeks and people with young skin can do facial once every month. Taking care of your hands and feet regularly is also essential just like taking care of your face. If you have dry skin on the feet and hands it clearly puts forward that you are not taking enough care of your body. Cut, File & Polish: This sort of manicure involves cutting of nails, filing them into a favoured shape and application of nail paint. Classic Manicure and Pedicure: This type of manicure comprises of grooming the nails, using hand massage creams and massage lotions to massage the hands. The nail paint is then put on the fingernails. Spa Manicure and Pedicure: This type of manicure comprises of the removal of skin tanning and dead skin. After the hand massage is finished, a mask is put on the hand. Later the client can choose her own nail paint to apply on the fingernails. De-tan Manicure and Pedicure: This type of manicure involves the use of select products with de-tanning properties. Just one de-tan manicure session can lessen the tanned skin on hands. Soft Waxing: This waxing type employs the use of a thin soft wax layer that is spread in the direction where hair grows on the skin. A strip of paper or cloth is then put on top of the wax and it is pulled from the opposing direction. 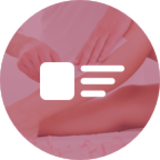 Soft wax lying between the strip of paper and skin takes out the hair from the roots. Cold and hot wax are the two major types of soft waxing. The abdomen, back, legs, arms and face have less hair density that makes these body areas ideal for soft waxing. Hard or Peel-off Waxing: In the hair growth direction, a thick hard wax layer is spread first and then it is pulled from the opposite way. Strips of paper or cloth are not required as the hard wax is peeled off in this method. The bikini area, eyebrows, and underarms have high hair density and they are coarse, which makes it suitable for hard waxing. It is a hair removal technique best suited for doing away with facial hair. In this technique, a cotton thread or polyester thread is folded and curled to move on the areas where hair is not wanted. This method not similar to tweezing as it is able to remove more hair strands than one. Threading works on small rows of hair and a preferred shape can be created with this method. Heal from within: The roots of the hair are thoroughly nourished and hair follicles become stronger with deep hair conditioning treatments. Increasing hair growth: Hair salon treatments comprise of hair massages to revive the scalp. This promotes the growth of hair. Improved Blood Supply: Healthy hair can grow with hair massages as they help in intensifying the blood circulation. Hair Nourishment: The hair is properly nourished with the products utilised in hair spa treatment and it also gets a fine lustre. Longer lasting colours: A hair spa benefits people who have coloured hair as well. Apart from causing hair growth, nourishment of hair cuticle and moisturisation of the hair length, a hair spa makes the colour last longer. Even after a handful of washes, the colour of the hair would hair look new.